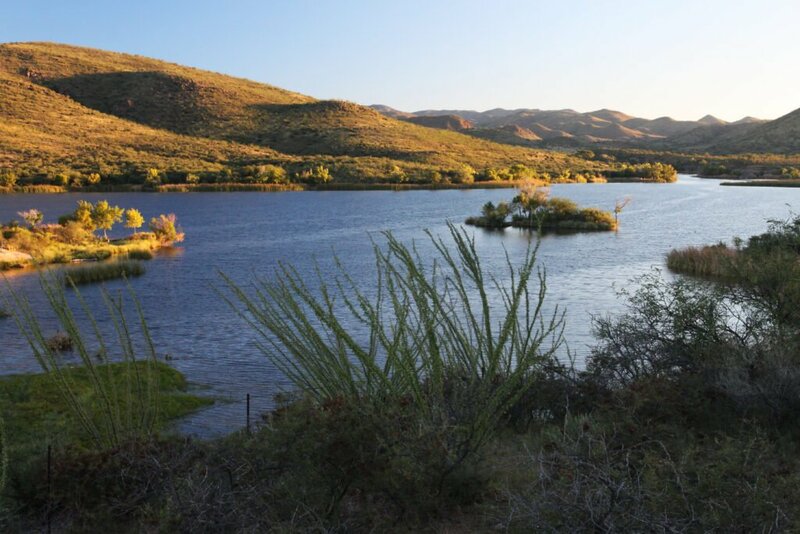 Though you probably know the Southwest for its desert landscape, you might be surprised by the many scenic lakes where you can go waterfront camping. These lakes are an oasis for activities like swimming, fishing, and kayaking, and they have campgrounds that can accommodate RVs and trailers. 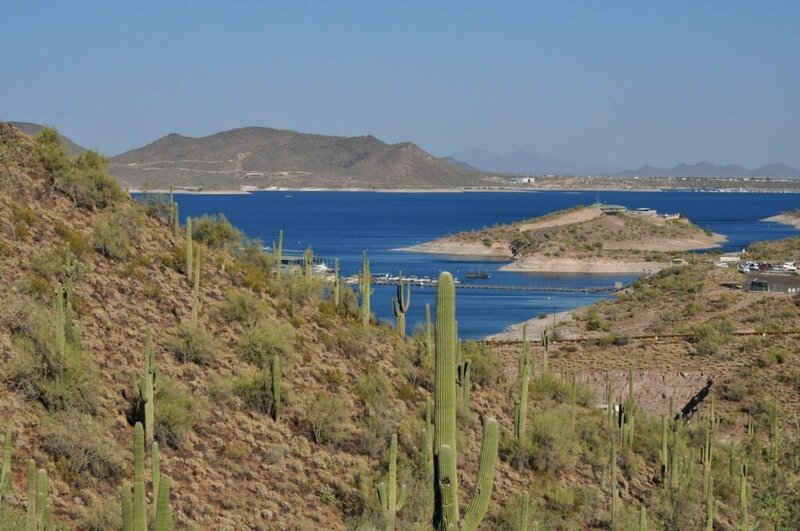 The cool blue Lake Pleasant is located in a regional park about an hour north of Phoenix. The recreation area is open year-round and has campsites, hiking trails, boat ramps, and a Discovery Center where you can learn more about the area’s plants and wildlife. The developed sites are complete with water and electricity, a covered ramada, picnic table, barbecue grill, fire ring, and access to a dump station. If you don’t mind dry camping, the semi-developed sites have similar features except for hookups and they’re about $10 cheaper. 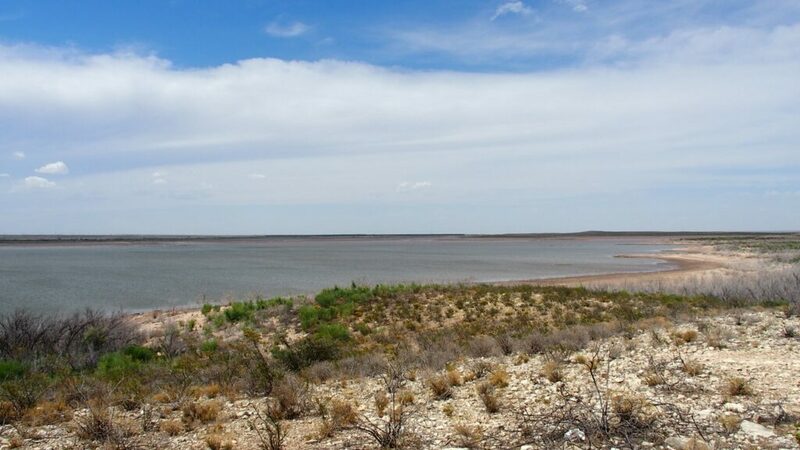 With the scenic backdrop of the Caballo Mountains, this lake is one of the prettiest in Southern New Mexico. The park is located between Truth or Consequences and Las Cruces, with easy access off Interstate 25 and Highway 187. Primitive and developed campsites are available along the reservoir including sites with 30/50-amp power and full hookups. They also have group campsites and a group picnic area. 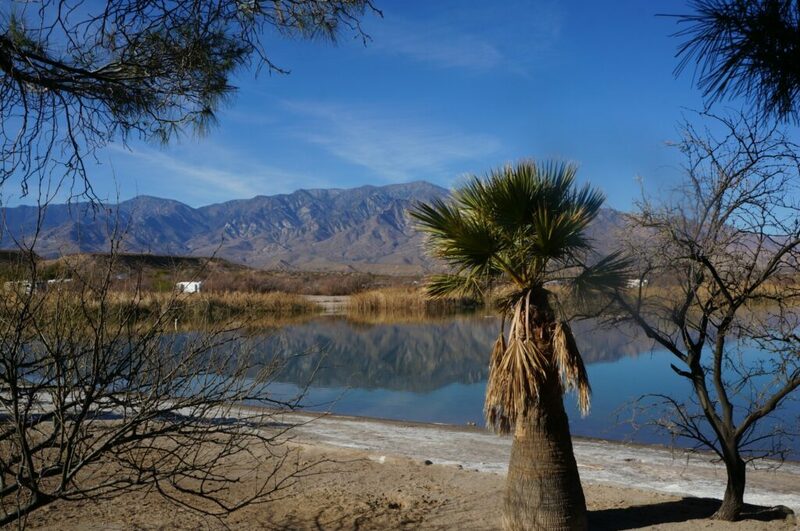 Northeast of Tucson, Roper Lake is surrounded by palm trees and views of the Pinaleño Mountains. The lake has a swimming area, boat ramp, and variety of fish to catch like largemouth bass and catfish. There are lakeside campsites for tents and RVs as well as furnished cabins. The campsites fit motorhomes up to 45 feet long and include water and electric hookups. 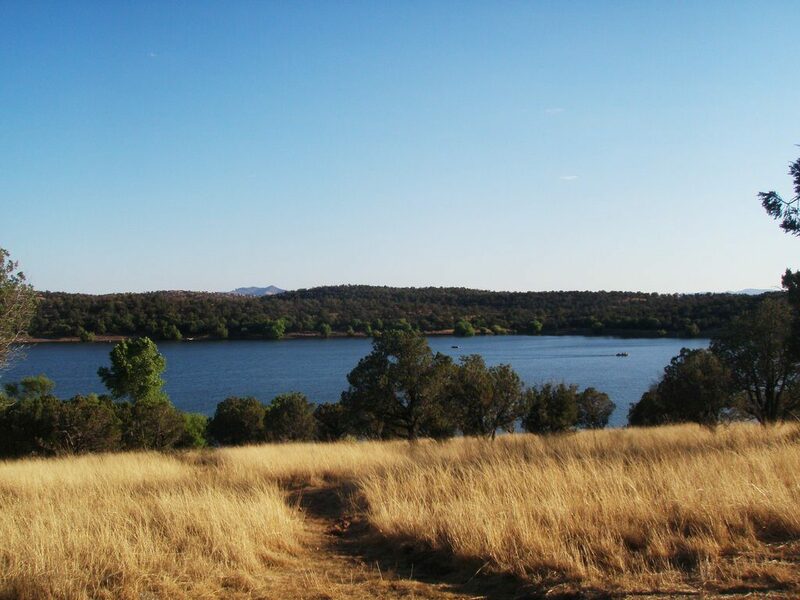 Patagonia Lake is well known for its great fishing in Southern Arizona. The park also has a beach, boat ramp, and a picnic area with tables and grills. If you don’t have your own watercraft, they offer canoes, pontoon boats, row boats, and paddle boat rentals. The campground has over 100 sites with electric hookups, picnic tables, and fire rings. Waterfront cabins can also be rented on the southeast end of the lake. The park can get crowded, but it’s usually more peaceful during the off-season and middle of the week. 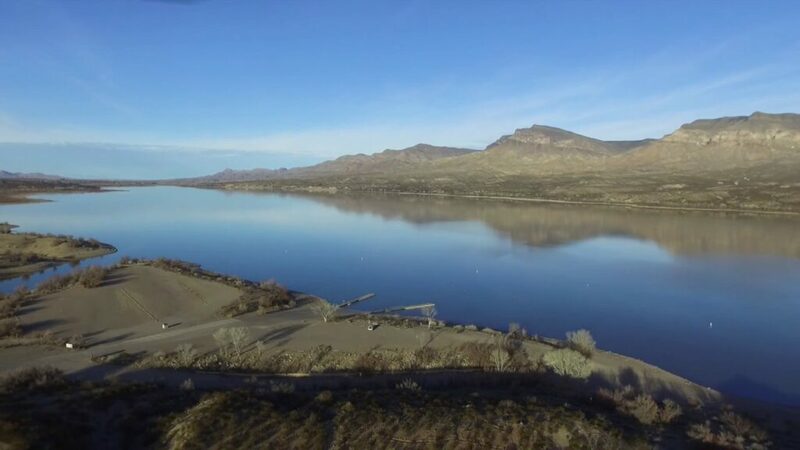 Parker Canyon Lake is off the beaten path and not as easily accessible but it is usually much less crowded than Patagonia Lake. The USFS campground is open all year; in the summer there are also boat and paddleboard rentals available. Lakeview Campground overlooks the lake with 65 campsites (max length 36 feet) on top of a hill. There are no hookups, but there is potable water, a general store, and restrooms. It’s also very budget-friendly, sites are only $10 a night! Lakes Mead and Mohave are both on the Colorado River and worth a visit in the RV. The two reservoirs are located within the Lake Mead National Recreation Area, a day trip away from Las Vegas. There are several campgrounds and RV parks along the shores of the two lakes. The NPS sites cost $20 nightly and are available on a first-come, first-served basis. 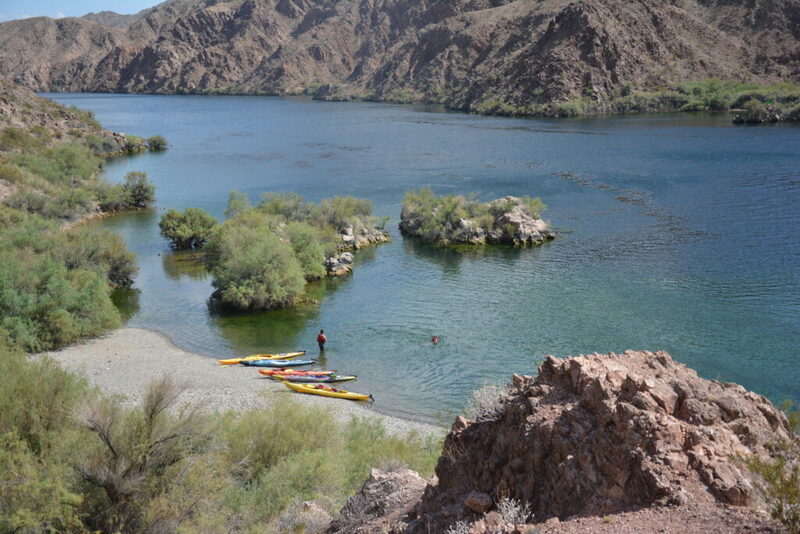 These include Las Vegas Bay Campground, Callville Bay, Boulder Beach Campground, and Echo Bay. The RV sites at Lake Mead RV Village are more expensive but include pull-thrus and full hookups. The largest state park in New Mexico surrounds the state’s biggest reservoir. 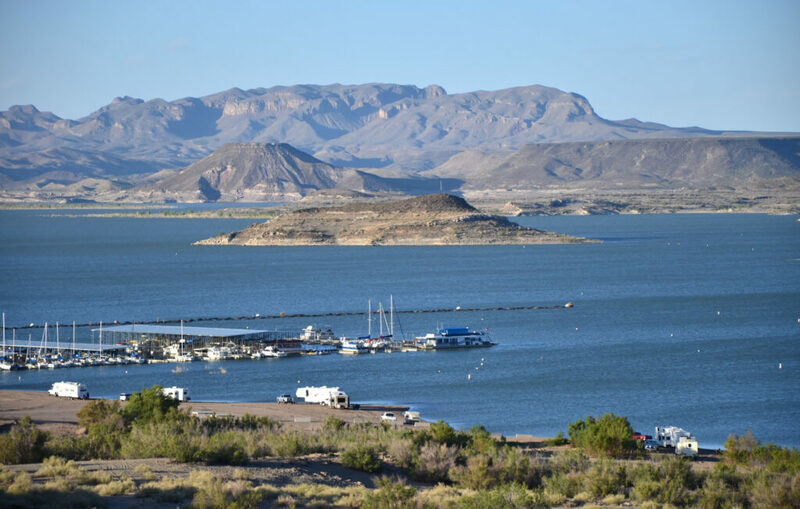 Elephant Butte Lake has beach access, a fishing pier, marinas, and boat rentals. The park has 15 miles of hiking and biking trails as well as several picnic areas where you can enjoy lunch overlooking the lake. There are about 170 RV sites in Lions Beach, Desert Cove, and South Monticello Campgrounds. There is also primitive beach camping, group sites, and boat-in camping available. Many RVers have made Brantley Lake State Park their home base while visiting Carlsbad and Carlsbad Caverns. The park surrounds the southernmost lake in New Mexico and is a destination in itself between the camping and many water sports. In addition to activities on the lake, the park has hiking trails, picnic tables, and an RV campground. Partial and full hookup sites are available as well as a dump station, restrooms, and showers. Do you know anything about Big Lake, AZ.? A beautiful high country lake in Arizona’s White Mountains. At around 8 or 9 thousand feet so snowed in wintertimes but a busy retreat for Phoenix and Tucson dwellers in the summer. Bring your kayak and fishing pole. Check on power limitations on boats. There are campgrounds but can get filled up. There are other lakes in the area as well. Close by the Apache people have lakes on their land and a winter ski area. Check White Mountain Apache info online for permits and rules or in person in the village of Honda just east of Lakeside-Pinetop. For Big Lake info is with the US Forest Service.